ScreenLight is a private video sharing and collaboration application for production companies, advertising agencies, and editors. ScreenLight makes it easy to securely review videos with clients, capture feedback, and get videos approved. 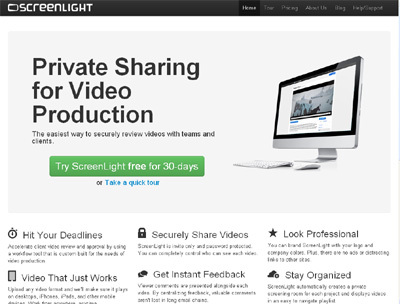 ScreenLight provides an online hub where video producers can upload and privately share videos with teams and clients. Reviewers can easily provide comments that are presented alongside each video. Video projects are password protected, and people will only see projects they have been invited to participate in. The service can accept virtually any input video format, and videos will be automatically encoded for playback on desktops, smartphones, and the new Apple TV. Clients can present a professional image by branding the application with their logo and corporate colors. ScreenLight has been custom designed to simplify the video production workflow. Other video hosting solutions lack the easy user management and privacy controls offered by ScreenLight.